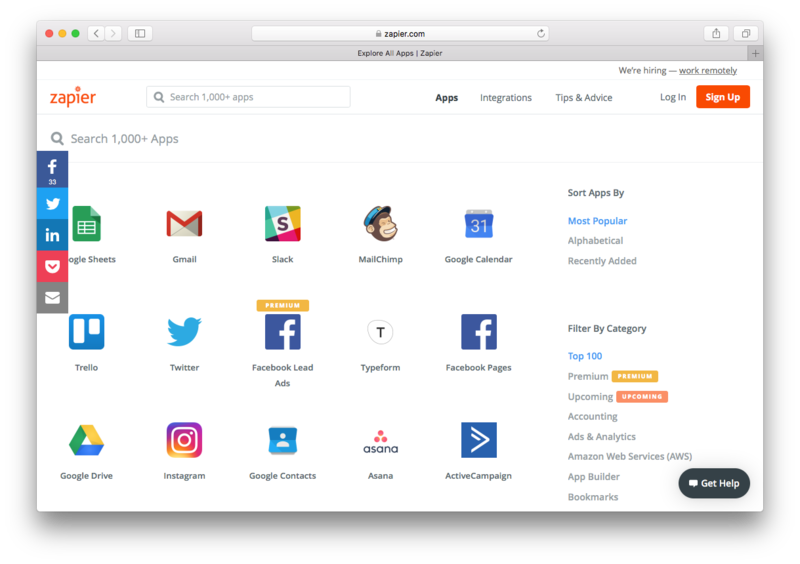 With more than 1000+ apps and integrations available, it’s a little addictive scrolling through the “zaps” (that’s Zapier speak for integrations) and seeing them come to life. The purpose of Zapier is to free up the time you spend on mundane tasks, like monitoring social and syncing accounts, allowing you to shift their concentration from the banal to the bold and make better, more creative use of your time. To help you get started using this incredible tool, I’ve compiled 43 ways to improve your marketing automation with Zapier. Facebook is one of the most important ways for most businesses to connect with customers. Zapier can integrate with Facebook in a number of ways that will make your marketing automation strategy more potent and efficient. Automatically post new WordPress posts to a Facebook page. Update your Facebook page when you publish a new WordPress post. Share posts to your Facebook page across other social media platforms. Remind your Facebook fans of events that are in your Google calendar or that you have scheduled on MeetUp. Post to your Facebook page every day. There are literally hundreds of ways that Zapier can automate Facebook posts and integrate with other apps. In this instance, Zapier does the work of a full-on virtual assistant – and it does it all automatically in the background without you having to think about it. Facebook is almost like the basecamp of most modern social media campaigns, and Zapier can help ensure that your client’s Facebook page is constantly filled with high-quality, relevant posts. In many ways, it seems more difficult to create content for Instagram than for other social media platforms, such as Facebook or Twitter. Perhaps that’s because Instagram is an incredibly creative and image-heavy social media platform. 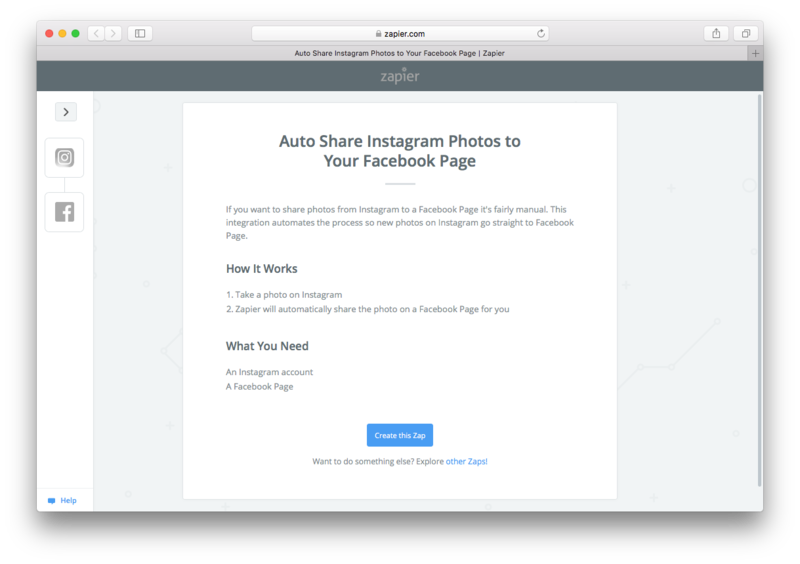 Zapier can help you automate Instagram in ways that will immediately make this part of your social media strategy easier and more effective. Save all your new Instagram photos to Dropbox for easy archiving of all your images and posts (applied to all your photos or those you designate with a specific tag). Create a new RSS post from all of your Instagram posts or from those you designate with a specific tag. Create new Facebook posts when specific, designated users post to Instagram. 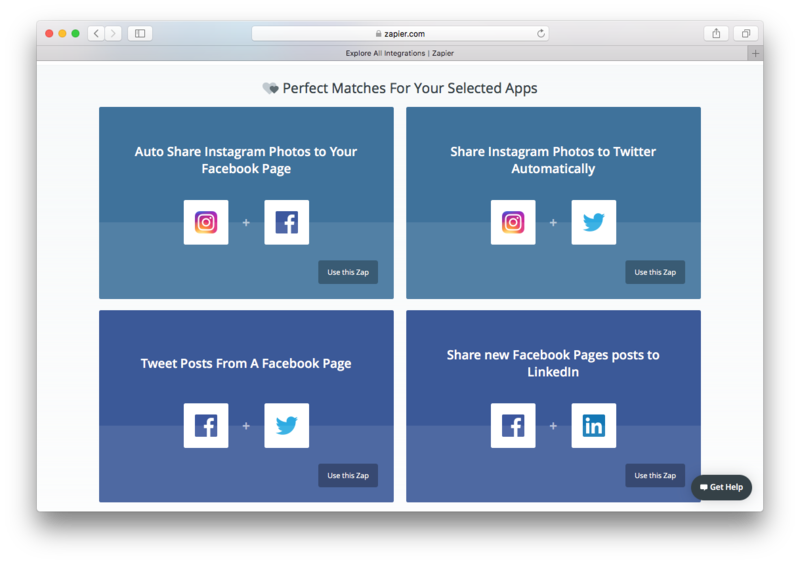 Automatically share new Instagram posts or photos across a variety of social media platforms, from Facebook to Twitter to other Instagram accounts. Curating a fantastic Instagram profile can take time – as can creating new images for your client’s account. Automating as much of the process as possible frees you up to focus on improving (or maintaining) the quality of your images. Gaining followers and encouraging interaction on Instagram means you have to constantly engage with well curated, high quality photos. Leaving the small stuff to your marketing automation platform means your social media automation strategy can do more with less. Twitter just might be the fastest moving social media platform there is. Marketing automation can help you keep up with all of the conversations that include your clients, 24 hours a day. Improving engagement on Twitter often makes it easier for your clients to stand out and succeed in an increasingly busy and crowded marketplace. Twitter is one platform where an adaptable marketing automation platform can help you excel and engage, particularly when integrated with WordPress. Immediately Tweet at new Twitter followers. Tweet about new blogs posted to your WordPress site or to other platforms. Tweet about your new Instagram pictures with an appropriate preview image. Receive email notifications of specific types of user Tweets in order to coordinate your replies or monitor mentions. Share posts from various social media platforms (including Tumblr, Facebook and Instagram) to Twitter. When you get a new follower, create a GIF from GIPHY in order to celebrate your users. Because Twitter is such a fast-moving community, marketing automation can be incredibly important. With the recent introduction of new rules around marketing automation, however, Twitter has made compliance more complicated – meaning that Zapier is more important than ever. It takes the right marketing automation platform to ensure you’re doing things the right way! And that’s why something like Zapier is important: you can set up this particular tool to behave in exactly the way you want with very specific interactions. That way, you can always steer to the right side of Twitter’s terms of service without sacrificing marketing automation and efficiency. Easily the most popular social media platform for professional networking, LinkedIn can also integrate with Zapier to make your digital marketing life a little bit easier. Expanding your network on LinkedIn is a touch different than on other social media apps, but content is still king. New content, in fact, is among the most successful ways to keep yours and your clients’ LinkedIn pages active in professional circles. New RSS items can be shared via your LinkedIn company profile. New blog posts, whether published to a WordPress site or other venues, can be shared via your LinkedIn company profile. Share LinkedIn posts via other social media platforms (such as Facebook or Twitter) and vice versa. Post webinars captured through AnyMeeting to LinkedIn upon their completion. Share any new MailChimp campaigns via your LinkedIn company profile in order to reach the widest audience possible. Share events (such as those created via Eventbrite) to your LinkedIn company page. LinkedIn is easily the most professional and business-like of the popular social media platforms, so all of your interactions will require a delicate touch. That makes Zapier an essential automation tool because you have total control over what is and is not integrated across platforms. Zapier can adapt to your social media strategy, so your client’s LinkedIn page can project precisely the persona you’ve calibrated. With Zapier working to automate your social media strategy where appropriate, your LinkedIn profile will be more integrated, offer better content, and be significantly more efficient. Sometimes your digital marketing strategy is determined by the platform. When you’re posting to Twitter you do one thing. When you’re active on LinkedIn you do another. But sometimes your strategy is determined by the content first, followed closely by the manner of distribution. Zapier can be useful in this particular situation because you can create automation specific to a type of new content. Get email updates of new posts to your RSS feed. There are so many different types of content you can create today that it can be difficult to settle with just one simple strategy for your social media automation. Zapier can help you find the best ways to automatically share and publish a wide variety of media and content, from video to images to blog posts to white papers. Publication is only one aspect of a good social media automation strategy. Everyone from Google to Facebook to Twitter is looking for certain signals that they use to help them identify high quality content. One of those signals is interactions: how many people like, comment, or share your content? Automating these kinds of interactions can boost the visibility of your content without causing a disruption to your workflow. Automatically share new Instagram posts to platforms such as Twitter and Facebook. Share new Tweets to other social media platforms automatically (you can do this with tagged posts or all posts). Like or share specific types of posts across different platforms. Comment or like Instagram posts with specific tags or content. Set up Instagram, Twitter, or Facebook to email you when new posts of a certain type or tag are published. Catalog posts in a variety of apps, such as Dropbox or Google Drive, making it incredibly easy to archive all of your social media activity. You do want to be careful with automated interactions. It’s important that you add quality content to each social media platform and abide by their terms of service. Zapier lets you choose “zaps” that complement your overall social media strategy, making it particularly good at navigating what are sometimes tricky interaction decisions. One of the most basic functions that any marketing automation platform has to fulfill is that of scheduler and project manager. 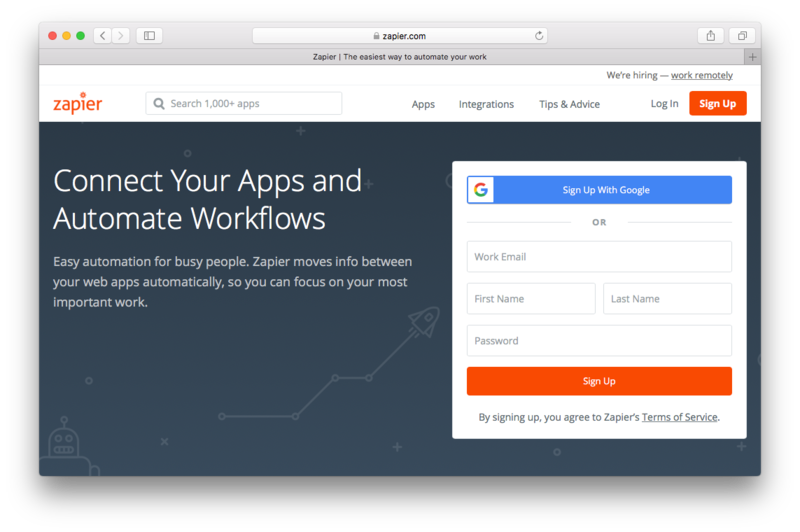 Zapier has several “zaps” that allow you to accomplish just that, either natively or via other tools such as Hootsuite or Buffer. Schedule posts for Facebook, Twitter, and (with some app integrations) Instagram. This means you could plan out a month’s worth of social media posts in a couple of days! Ensure that all posts, Tweets, and publications are easily reviewable before they go out. All scheduled publications and posts on social media projects are easily and automatically archived. Schedule boosts to your pages or posts, either through sponsored posts or via retweets, likes, and other engagement. Create a cohesive and enduring social media strategy, with the project management tools and accountability to make sure that strategy is followed. Schedule Tweets, posts, or other social media content to be published based not on the day, but on some other occurrence, such as a blog post or a trending keyword. Monitor your social media mentions for your brand names or relevant content. How does this help me as a marketer? The big question with Zapier is pretty simple, and I think it can be summed up like this: how does Zapier and all its zaps help me as a digital marketer? These days, there is no shortage of tools. Everywhere you look there’s a new app that’s somehow guaranteed to help you break through and achieve unparalleled success. The truth is that a good digital marketing campaign is a lot of work. The tools that help are the ones that streamline that work, making the tedious tasks easy so you can concentrate on the creative solving problems. That’s what marketing automation platforms are great for. That’s because most digital strategies emphasize the web in world wide web. The more “nodes” in the web your content touches, the more successful your campaign is likely to be. Marketing automation with Zapier can help you reach as many of those nodes as possible without having to increase your workload. Zapier can help you in literally hundreds, if not thousands, of different ways. Not everyone will use all of those social media automation zaps. (In fact, very few might.) But the point is that there’s something for everyone, and you can pick and choose which zaps will help your strategy run more smoothly. Tools such as Zapier and other marketing automation platforms succeed because they enable the marketer to make smarter, savvier, more efficient choices. In other words, Zapier is putting a whole lot of power squarely in your hands. It’s up to you to figure out what to do with it. There is certainly no shortage of options. The post 43 Ways to Effective Social Media Marketing Automation With Zapier appeared first on Revive Social.